Our newly expanded 19+ acre riverside camp is intended to provide ambiance and charm that will make a lasting impression. The landscaping of the camp harmonizes with nature providing a wilderness feel, but with the comforts of home. 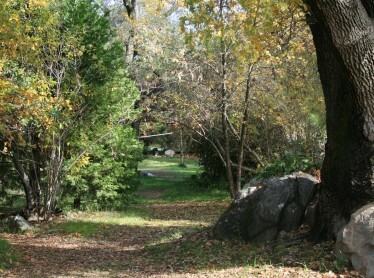 Our camp is quiet, nature based and available only to our guests. 1/2 mile of riverfront with multiple charming eddy pools and small beaches, all connected by our Nature Trail. Large and small group camping available. Zip Line and Challenge Ropes Course: Nowhere else on the West Coast can you combine zip lining, team building, and whitewater rafting like you can at MaLode! Camp Store – Our “greeting yurt” houses our check in, photo area and camp store for those last minute items such as Chums, a disposable waterproof camera, even sleeping bags if you forgot yours or just flew in from out of town. Organic garden – we grow tasty veggies on site, and the garden is a perfect spot to sit and watch the hummingbirds dart to and fro. Sustainable Practices Program featuring solar electric power and water heating, and uses waste vegetable oil biodiesel for vehicle fuel to achieve an 80% carbon reduction over conventional fossil fuels. We pride ourselves in striving toward achieving the lowest carbon footprint of any river company. Multiple groups? Want to separate girls from boys? On your honeymoon and want to be all by yourself? It is all easily accommodated! This section of camp can comfortably accommodate 120 people. It has dozens of tent camping locations along with 10 platform canvas cabin tents, which are artfully sited with plenty of space between each tent. Cots and foam mattresses are available for your comfort. Other features include bathrooms with flush toilets, hot shower facilities, private changing areas. Main Lode also has large open play spaces, a volleyball court, horseshoe pit, and a large commercial kitchen where we prepare group meals to be served in a sheltered picnic table dining area. A 30-foot diameter yurt provides indoor space for meetings, yoga, meditation or additional group sleeping space. 3 stonework campfire rings are provided near the river. 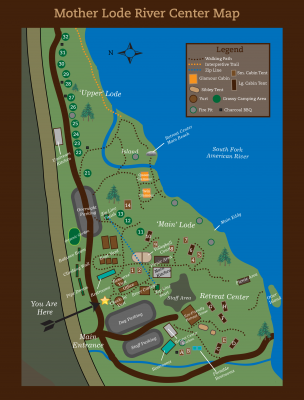 The glamour cabin tents with beds, furniture and private riverside sites are features of Main Lode located upstream of the main beach area (colored orange on the map). Not a camper? No problem–we have a cozy river cabin available to rent as well. Our newest addition to the property can comfortably accommodate 80 people. It has 6 platform canvas cabin tents, and several dozen additional tent camping sites. This section of camp also features our eco-friendly retreat house. 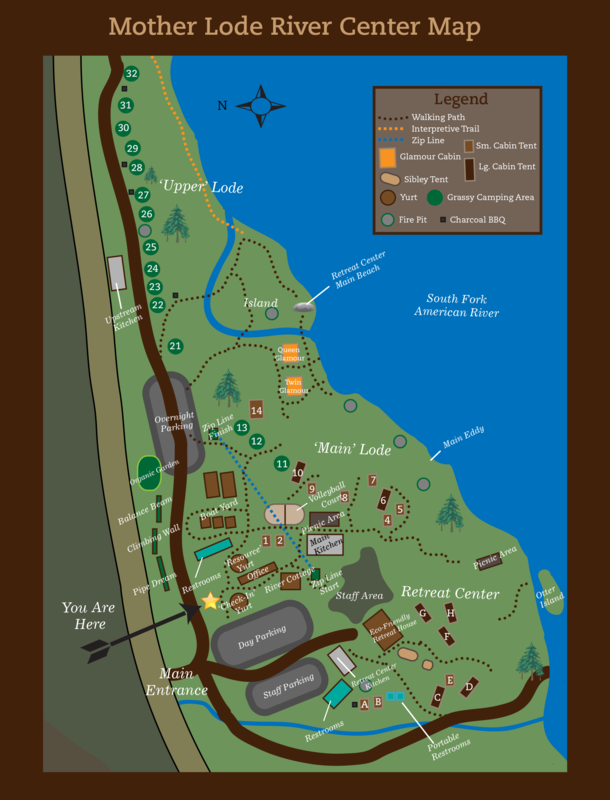 The retreat center mirrors main lode’s amenities, with flush toilet bathrooms, hot showers, a commercial kitchen and dining area, a multi-use yurt, a stonework campfire ring, and large open play spaces. The riverfront here also has the largest calm eddy pool on the property. (Sites 21- 32) are easily car accessible and features our most popular camping site, “The Island” accessible by a stone footpath and bridge. Further upstream is more car accessible camping, as well as a full “wilderness kitchen” with hot and cold running water, sinks, refrigeration and stoves which are all available for rent to Scouts and other responsible groups who don’t want to haul everything with them. Beautiful autumn colors dot the landscape of the River Center during late season.